Part 7 of CabWriter Comprehensive is all about ‘cleanup’; that part of a modeling project where you eliminate necessary parts, customize some parts, add parts that are missing (e.g. 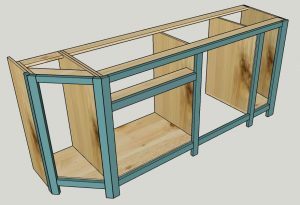 shelves), lengthen or shorten parts, add custom parts to the CabWriter cabinets or any other editing necessary to complete the model. In Part 7 I show you how to clean up the toe kicks along the west wall (refrigerator wall), around the peninsula and the island. I point out some problems you can run into when you add a door or drawer with the Insert a Door/Insert a Drawer tool if you forget to load the CabWriter Settings with the cabinet’s stored defaults. I introduce you to the Create a Back Panel tool to dress up the peninsula. At the end of Part 7 there is still more clean up to do but it is standard SketchUp operations and not unique to CabWriter modeling. But at the end of Part 7 we are very nearly complete with the modeling and will soon begin creating the scenes we will need to produce architectural and construction drawings. 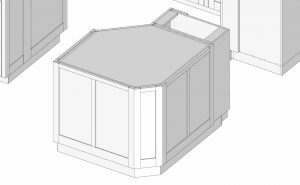 While recording Part 7 I got an email from some one asking if CabWriter could draw a standard base cabinet with an angled front. See the image above left. I wrote back and told him that CabWriter currently could not draw it directly. 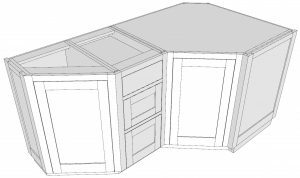 But pointed out that CabWriter is a SketchUp plugin and as such he could draw a standard base cabinet and modify it quiet easily. This relationship between CabWriter and SketchUp is so powerful that I wanted to share it here and perhaps I will do some blog posts on other examples. The picture at right is a model I quickly created to demonstrate how this might be done. The angled cabinet at the end started out as a standard base box. 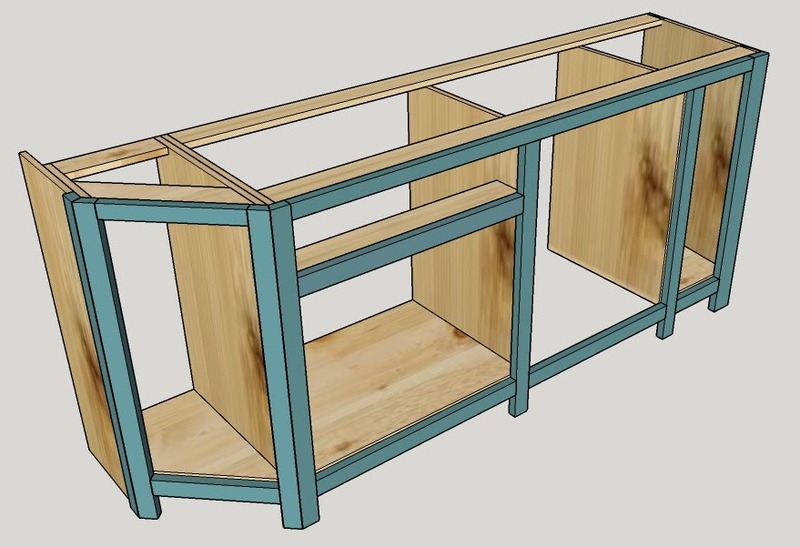 I shortened one side being careful to keep the front and back shelf holes (a SketchUp trick I will share some day), cut the shelves and bottom at an angle, rotated and re-sized the door and added the end panel with the Create a Back Panel tool. I could have also let CabWriter draw an end panel on the standard base cabinet and then re-size it, but the Create a Back Panel tool is easier. Lastly I re-shaped the toe kick adding some diagonal pieces. 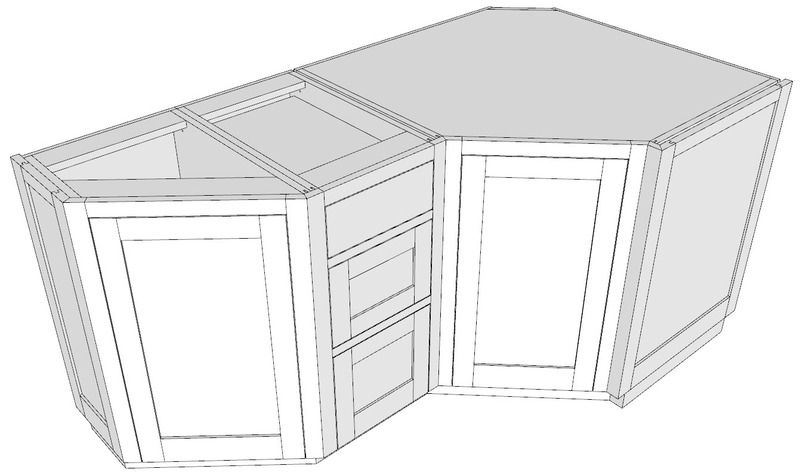 The combination of CabWriter and SketchUp give you all the tools you need to tackle any design. Don’t let non-standard cabinets and furniture pieces scare you. Jump in and be creative. Now cook the popcorn, relax, sit back and watch this very exciting Part 7.